Okay, summer vacations are over and the kids are back in school, so this can mean only one thing, “party.” No, just kidding. The truth is as adults we are always working so this really doesn’t apply to us this much anyway. We are always on the go and have things to do away from our home but it’s also nice to get back to basics and this is a good time of the year to do that. One of the things that I have recently been thinking about as the weather has been more cooperative this summer and not as hot is the fact that I have been finding myself spending more time outside than I have in the past. Normally, I just can’t stand to be outside in super steamy weather but this August has been really nice in the old Bluegrass state thus far. So, considering that fact, I have been wanting to do some things to our backyard to make it look better. The only problem with me wanting to do something to make it prettier is that it always ends up running into spending money. I don’t mind it as long as it’s not too far out. I tend to keep track of things with a budget and when you see where your money goes it makes it harder to justify just blowing it on large, expensive items, unless you know for a fact that it will give you a nice return for your investment later. The issue I have though is that when I want something, I tend to want it right now, especially if I get on a kick for home improvement. I try to tell myself that I need to wait it out and save up for it but that can be really hard to do. However, since I have been doing a lot of research online, which I absolutely love to do on almost any subject matter, I have found some very interesting ways to spruce up the backyard and not go broke in the process. 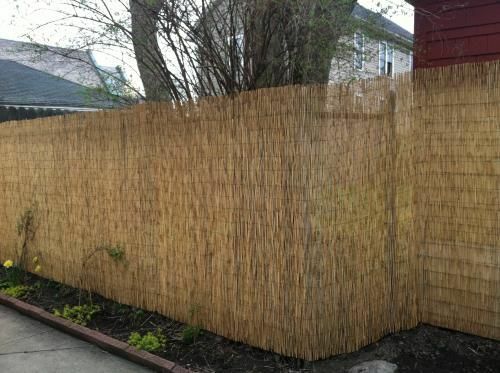 One of the things that I discovered on my google searches was the idea of buying packages of reed fencing in a roll and laying it out against the chain link fence we have at home. I have bought quite a few packages of this and have probably spent a little more on the one hand than I would have liked but then again I am amazed at the difference it has made for our old chain link fence. It has really spruced things up and it helps to hide the fence itself, which is the whole ever-loving idea in the first place. Anyway, I am really pleased with the results and now I am starting to look at other areas that I can look into sprucing up. So, with that idea in mind, here at the Daviess County Public Library we have lots of neat books on gardening, deck and patio furnishings, landscaping, building wooden structures for your back yard and so on and so forth. All you have to do is stop by the library to see what we carry in these areas and then you can go home and try a few out for yourself. Of course, in my case, I use the Internet quite a bit to find ideas as well so these are a few sites that I recommend on your search for a new and improved backyard. Remember you can also use your library card to use our Internet services here at the library if you don’t have a computer at home too.